Imported. 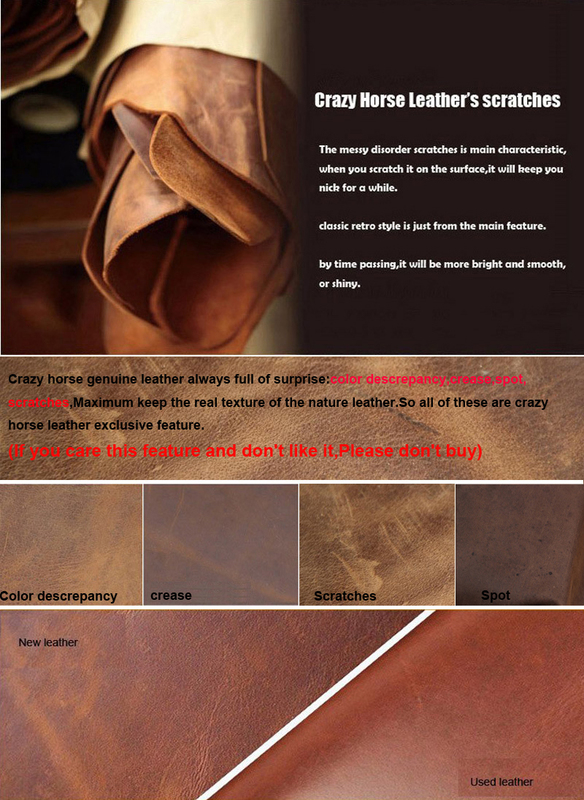 100% Top Layer Crazy-Horse Genuine Cow Leather with durable polyester lining. HIGH QUALITY: Genuine leather and bronze tone hardware.This strong leather is very durable. push the epidermis can produce the effect of color. Structure: 1 main pocket, 1 inner zipper pocket, 1 inner slit pocket, 2 front pocket. Can be placed mini pad, umbrellas, wallets, mobile phones and small items. Not suitable for laptops and A4 books. Dimension:17(L)*9(W)*26(H)cm, Weight: 0.52KG, Shoulder straps:120cm (Adjustable). This sling backpack comes with a long crossbody adjustable strap, could worked as shoulder pack,chest bag,crossbody backpack, can be worn in the front or back. Occasion: casual (keep your hands free but without the bulk of a regular backpack), outdoor sports (hiking, camping, climbing, running, cycling, bike riding, trips etc), shopping and so on.